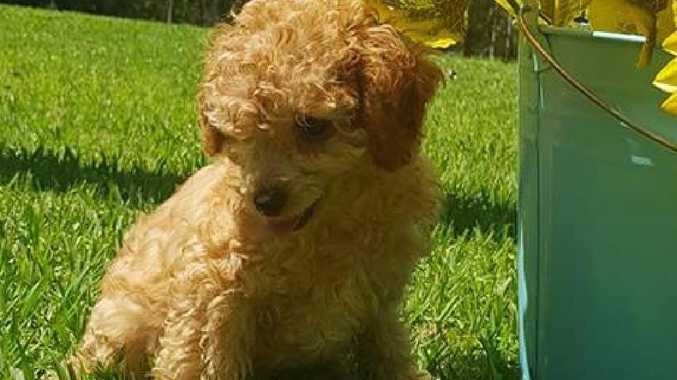 Miniature poodle, Scarlett Faith, who is blind and has spinal problems, has found a loving home at the Storybook Farm. Picture: Supplied. AN ANIMAL rescue group raided by the RSPCA this week was not a registered charity, it has been revealed. A spokeswoman for the Office of Fair Trading said Storybook Farm Sacred Animal Garden Rescue - which had 37 animals seized by the RSPCA this week - was not and had never been incorporated as an association or registered as a charity. "Storybook Farm - Sacred Animal Farm is not registered to fundraise in Queensland," she said. "Any association with charitable objectives which undertakes public fundraising appeals in Queensland is required to be registered under the Collections Act 1966. "The Act requires an association to keep proper financial records, have them audited annually, and lodge a copy of the audited records with the OFT." Graphic image of an animal rescued by the RSPCA from Storybook Farm-Sacred Animal Garden. 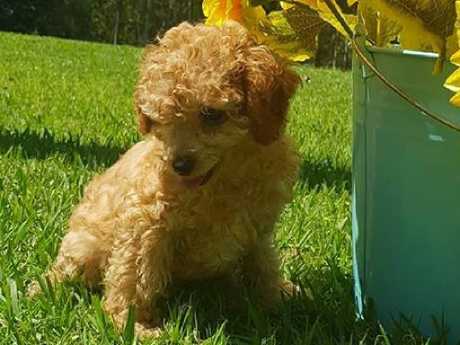 Picture: RSPCA Queensland. 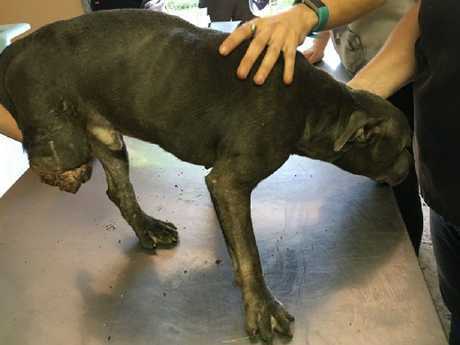 As various animal rescue groups express their shock and distance themselves from the once-popular rescue for disabled animals by posting statements on their social media pages, RSPCA Chief Inspector Daniel Young said he hoped it would not put people off supporting charities. He said in this case, so many animals being cared for by so few people was "a recipe for disaster." Storybook Farm was started by Lisa-Jayne Cameron, also known as LJ, a number of years ago as a result of her family being unable to find a support service for their family dachshund, Mr Waddles, after he became paralysed. She has previously told media that she planned to have her rescue group registered as a charity in 2016. The farm was moved from Canungra to north Brisbane in 2018 with a number of fundraisers, many held on the group's behalf, assisting with the move and ongoing costs of running the property. The group also regularly received both cash and other donated items such as blankets and pet food from various community groups. A recent GoGetFunding crowd-funding campaign started by Tina Smith, a Storybook Farm supporter, had $2620 raised as of Wednesday but has since been stopped and removed from online. Requests for financial assistance, now removed from online, stated that the farm was in dire need. "Storybook Farm is actually in dire need, not only are they desperately short of funds to care for the animals (vet medications, vet check-ups, special foods, supplements, bedding, the list is endless! ), Lj is also struggling each week with the enormous rent she has to pay on the property and the upkeep (sic)," the fundraising page reads. It refers to the possibly of the group having to be closed and mentions Rabbit the brain-damaged whippet, Hugo the three-legged dog, Matthew the blind staffy and Cody and Daisy, dachshund in wheelchairs among those who needed help. Insp Young said Storybook Farm situation should not put people off supporting animal rescues, but advised those wanting to support charities to "do their homework," and not base their trust on a professional looking Facebook site. "We're not suggesting people stop donating to charities but, if you're going to donate, do your homework. Make sure you know where the money or the gifts you're donating are going," he said. "Make sure they're a registered charity. Many rescue groups are not registered charities so don't be afraid to ask to see their financial reports. Get them to justify where they are spending their money." Insp Young said red flags, including with puppy farmers, was when someone did not let you view where a pet would be staying or if they suggested meeting somewhere away from their property. "In this case we're talking about a rescue group, so that should be open to the public," he said. "If you're donating to a rescue and they're not allowing you to enter the property, that should set off alarm bells." The OFT spokeswoman the office aimed to strike a balance between not discouraging charitable activity and ensuring public fundraising was not in breach of the Collections Act. "The OFT works to support charitable organisations and understands that, often, well-meaning people will begin to raise money for a cause that is important to them, and may not be aware of the official processes that need to be followed," she said. Messages have been left seeking comment from Ms Cameron.